This is not your usual outdoor programme. We invite you to a true freestyle adventure in the heart of Bulgaria, Veliko Turnovo. Created by a group of free spirits with the intention to share the mystical vibes of the old Bulgarian capital, we offer our FIRST DONATION BASED adventure. That’s right, you pay according to your abilities, desires, and experience. After booking with us you will meet our authentic local nature/cultural guides who will discuss your preferences and decide on where to go and what to show you. Spontaneously and following a common intuition you will enter an unknown environment with the people who know most about it. If you are looking for professional, certified guides please go to our paid adventure pages. This is more like a friendly Couchsurfing style outing that will give you a social and cultural, authentic knowledge of the magical place we call Veliko (Great) Turnovo. Turnovo is not only appealing to the tourists interested in culture, history, and archeology but also to those who enjoy the outdoors. The town is built on three hills and has Yantra river flowing through its heart. In the surrounding areas you will find plenty of easy trails and be able to explore waterfalls, caves, rock cliffs, natural freshwater springs and of course watch the sunset. 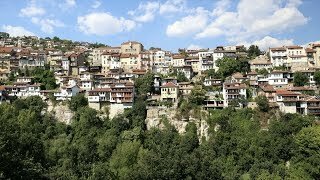 Veliko Tarnovo is one of the oldest towns in Bulgaria, with a history dating back to more than five millennia. The first evidence of human presence was discovered on Trapezitsa Hill (3000BC). In the middle ages, Turnovo had such a renowned influence in Eastern Europe that was sometimes called the Third Rome. On 17 April 1879, the first National Assembly gathered to ratify Bulgaria’s first constitution, the Tarnovo Constitution. In October 1908 Bulgaria declared independence from Ottoman rule in the Forty Holy Martyrs Church. This is just a small part of the historical significance this place has for Bulgarians. Nowadays Veliko Turnovo is one of the few towns with population growth. It is a place where culture, art, and education thrive. The town itself is a prominent tourist attraction with almost half a million visitors per year and a large expat community. The most popular attractions are Tsarevets Fortress which was the capital of the Second Bulgarian Empire and the ancient Roman fortress of Nicopolis ad Istrum.